This project was commissioned by Decadent Table, a subscription food and catering service. 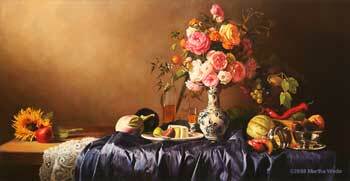 The clients requested a painting rather than a mural, in a style that conveyed the abundant richness and chiaroscuro of a 17th century Dutch still life. The painting includes the European fruit and flowers traditional to the genre, with the addition of sunflower and chilies to represent its location in New Mexico. For this project I used a very old oil painting technique, involving the multi-layered approach demonstrated here. This method emphasizes composition and value first, and achieves a unique depth and luminosity through the use of numerous transparent glazes. The palette was limited to 10 colors: titanium white, yellow ochre light, red ochre, raw umber, burnt umber, Prussian blue, ivory black, Chinese vermilion extra, cadmium yellow deep, and madder lake deep. The finished piece is 24'' x 48'' and took over 200 hours to complete.